Landscaping town projects in Active Worlds -- specifically Alphaworld -- is a special challenge that can reward the builder with a sense of character and atmosphere about their build. If you built a log cabin, would you want it built in a barren field or a dense forest of trees? You may not be interested in building an entire forest, but you can at least landscape the area around the house to give the image of a rural scene! Landscaping is also useful to cover and hide the errors of people you have let build in your town who may have shown to have sub-par building talent. No worries though, with the proper placement of nearby landscape even eyesore buildings can find a place in your city! To better illustrate this guide, I'm going to landscape one of my projects as we go along. The house below was built by a resident of Rising Glen Retreat. As you can see, it's a pretty sub-standard pre-fab house. They didn't even bother changing their lot back to grass1 to match the land around their house! Because they have so much spare land, I'm going to employ the use of create move quite a bit. The move command is especially useful for nudging trees and other large landscaping objects in close to a resident's home. Okay, first thing's first. We've gotta cover the mis-matching grass. I plan to do this by using the move command to push in some gentle hills onto the property. The hills cannot all come up to the house, though, because the builder's foundation has basement windows. It is important to be very aware of the building you are landscaping so you do not damage it's place in the surrounding area. Your goal is to give the place character, not to redefine it. That should do it. 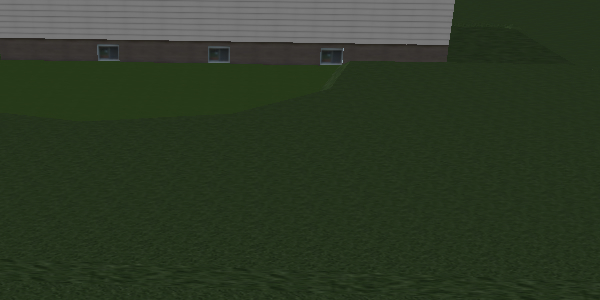 I used create move 0 0 10 time=0 wait=1e9 on each grass object over my resident's property to build the area. The original grass cover blends much better now, and the raised land around the house gives us a base to work with. As useful as trees are, be careful not to pack them too densely. Tree foliage uses masking, and masking sticking out of other masking can be buggy. It's best to place several tall trees in an area, and then to place several shorter trees between them. For best effect, be sure to turn each individual tree to it's own angle, and perhaps to make it sag a bit instead of standing completely vertical. You can also apply effects to trees, such as a move command to make them sway. 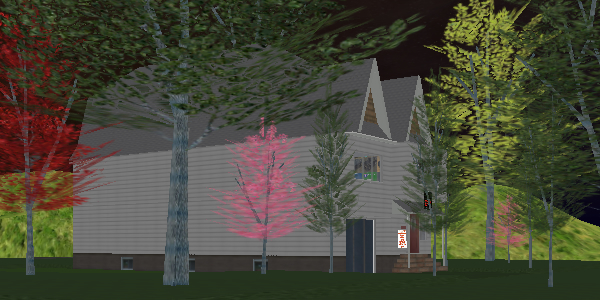 After fifteen minutes of work, the area around my resident's home is now covered in traze trees. Looks better already! There are several ways to go about making smaller foliage, such as bushes and shrubs. The most popular way is to use prefabricated bush objects, such as the t_awhedge set, or one of the many flower, flow, or shrub sprites on the Alphaworld path. Using a combination of t_awhedge objects, I'm going to line the side of my resident's house with a small garden. 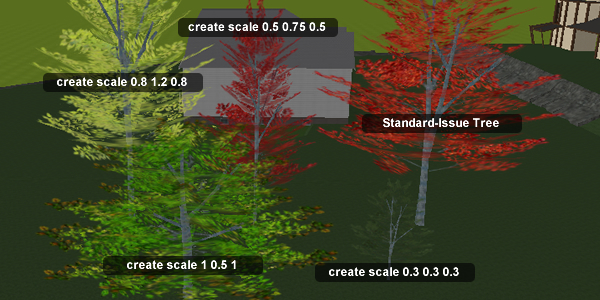 Again the scale command finds use, allowing me to make variable bush sizes. This is all fine and dandy, but I also enjoy making more customized foliage. You can do this by merging different types of bush objects together and changing their scales, and also by carefully placing tree objects within rocky outcrops. Place the tree to where the trunk is no visible, and where the outer edges of the foliage are visible sticking out of the rock. This gives the rock the appearance that some sort of plant is growing on it, and add yet another detail to your area. A landscaping detail I often employ is a rocky outcrop, which basically consists of a couple of rock10.rwx objects piled together and sunk into the ground. They are very useful, such as with the aforementioned custom foliage, but they also come in handy if you're interested in making any sort of ridge. I'm going to use rocky outcrops around this house to cut off part of the gentle hills I made earlier, and also to fill up some empty yard space. Paths are also useful detailing elements. Simple stone or brick paths can be made from using primitive shapes and texturing them, and dirt paths can be made by applying masks to textures such as dirt or boden. Paths create order and direction for visitors, and you can even spend time decorating them by placing fallen logs or water features nearby. A good technique Baro suggested to me some time ago is to make a pp30.rwx, lay it a couple of shift-clicks above the ground, and place a create texture boden mask=tree3m command on it. Make several of them in succession, and you have yourself a good path! Another detail that could be included is this guide is a ruin. Depending on what you're making, the ruins of a previous building in the area could spell adventure and intrigue for your build. Anything is possible -- from a very detailed foundation structure to something as simple as a fallen wooden post. After applying some basic detailing to our site, we've come to the end of the project. 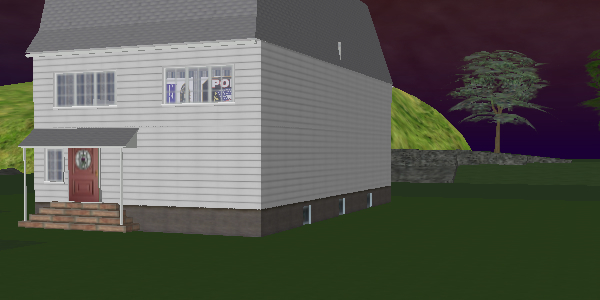 Really good detailing should take about an hour if you're going around a house, and here's the final product. The house doesn't look absolutely out of place anymore, and as it is now embedded in a forest of trees. Rocky outcrops and shrubs dot the property, and a small perimeter fence marks the yard as a dirt path extends to the front porch. A good day's work, I'd say! The following areas incorporate landscaping into the area around their building lots, and thus are a good example for the context of this guide.